This recipe explains how to save youtube videos as mpg or avi files on your pc, all done w/free tools and a site, ripzor.com. Also quick overview of google and myspace videos too. As most youtube users are aware of, Flash videos are a bit hard at times to capture. Most of the time to capture such videos, you would need to purchase retail video streaming software to do so. 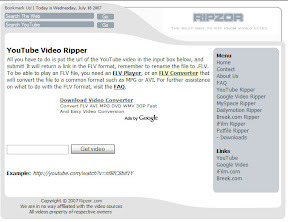 However, after some digging, i have found an alternative/free way of doing this using FLV Converter and a website, Ripzor.com. 1. First, we will need to get this program. 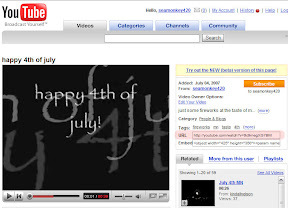 of july video as an example; http://youtube.com/watch?v=9c9megXG7BM ). Once you have the video up, click in the “URL” box and copy the URL to the video. and paste the URL of the youtube video into the text box hit the Get Video. 4. 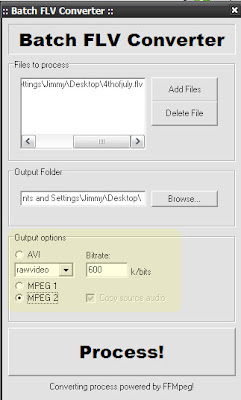 Now that we have the video in FLV format, we can now convert it either MPG or AVI using FLV Converter. 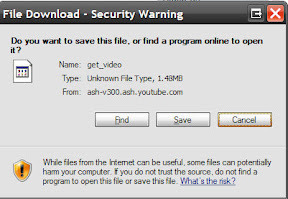 Click the Add Files button and choose the FLV file we created from the site. Click the Browse button to choose which directory to save to, i saved to the desktop in my example. Finally, the bottom options are what type of video format to save in and also a bitrate setting. you can play with these settings yourself. Finally, the process/converting will be done in a command line box, it will take a few seconds and then bring you back to the main FLV Converter screen. Hopefully you should have an AVI or MPG on your desktop of the clip. Its almost too easy! BTW, you can do the similar type of things w/Google Video, Myspace, and other VOD services on this site. Nice job RIPZOR ( http://www.ripzor.com ) !